This book describes the principles that underlie the measurement system used in Maharishi Vedic architecture in the language of Group theory. The Vastu measurement system is based on the square and its eight levels of symmetry. Using the concepts of modern Group theory from mathematics, the author shows the deep principles at the foundation of the measurement system of Maharishi Vastu design in a way that explains their logical significance. Measurements based on Vedic dimensions are vital to Vedic architecture because they bind its various parts together in harmony. The second part of the book explains how planning according to natural law for an entire country is practical, and beneficial for the population. This ancient system of country planning outlines the concept of the ''Brahmasthan'' or geographical center of a country, from where a grid based on latitude and longitude emerges. This grid forms the basis of Vastu planning for homes, villages, towns, provinces, and the whole country. It also details how different functions of a country, city or town are given specific placement so as to complement their own activity and not clash with other functions. This allows every country to be planned in accordance with natural law, creating harmony throughout society. 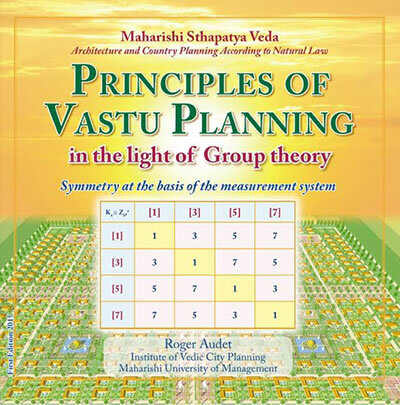 Principles of Vastu Planning in the Light of Group Theory is available from Maharishi University of Management Press. Click here to learn more about Maharishi Vastu Architecture.